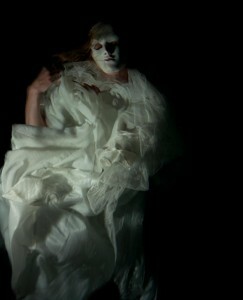 Growing up in Kailua, Hawaii, Christy Lee Rogers was always in the water. So it was only natural that as a photographer she would turn to experimentation with the medium that occupied so much of her childhood. 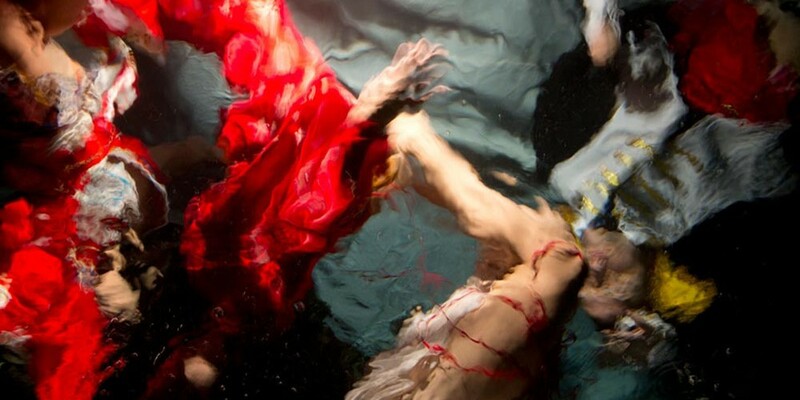 Her underwater shots are intoxicating: vivid swirls of color and darkness intertwined as human figures shimmer, seemingly weightless, in the water’s embrace. Shooting in the dark of night in her native state, Rogers works in-camera, using light refraction and other techniques to create warm, vibrant shots that resonate with an otherworldly yet intimately human quality. Her groundbreaking work has drawn comparisons to everyone from video artist Bill Viola to Baroque master Caravaggio, her striking spotlights and rippling chiaroscuro giving her collections, most recently “Of Smoke and Gold,” an old-world quality. But don’t just take it from us: In between shoots in Las Vegas, Rogers told Resource how a boogie boarding, daredevil teen became a fine art photographer dedicated to capturing the human spirit underwater. Photography was this freedom that I found in my teens. At a young age, all I wanted to do was create, in the form of performance art, directing family plays, painting and poetry; then when I was given my first camera, photography became a way to combine all of these art forms that I loved. With images I could express ideas that were difficult to say with words; it was a much more effective tool to communicate with. How has growing up in Hawaii influenced your work as a photographer? Hawaii nurtured my love for the water, and there’s an aloha there (or love) that can influence everyone. Most of my life was consumed with being in the water, and I used to be a pretty good boogie boarder. I’d hang out with the guys because they wanted to do the more daredevil things, and we’d go out every day to the beaches on the Kaneohe Military base, which had the best waves. My father was also a surfer, and he taught me a deep respect for the ocean and its power. Water was that element I needed in my photography to complete the expression that was locked inside. When did you first start experimenting with underwater shots? Actually, the first experimentations began in a short film I shot while in Los Angeles in the late 1990’s. From there, I then did a still shoot with a friend and had her jump in the pool. It was more of a love of the water that led to that decision but there was no going back from there, and it became the only place I was interested in shooting, away from reality. Do you plan out and direct your models’ poses, or does the composition happen more organically? How much can you control when water is involved? There’s a period of notebook sketching, where I gather ideas, feelings, concepts, colors, themes, inspirations, etc. This day dreaming part is where the compositions start, wildly out of control at the beginning. Eventually, ideas coalesce and a main concept is formed. From there I plan rough compositions, shapes and forms, and most importantly the stories behind the characters. This is what will guide me during the shoot. When the models arrive I give them direction and start by teaching them my technique and how to move within the water in relation to the other elements. From there everything is organic and experimental because you only have so much control in the water. This is when the real work begins, as now I must shape the models’ performances and inspire them so that we get the magic. I want them to be natural and move freely underwater, to be themselves, but I will continually guide them and sculpt our interaction, because in many ways they are blind underwater. Part of what gives your work such an “old-world” feel is the costumes you use to dress your models. What drew you to that aesthetic? Most of what you see in my earlier work is fabric as costumes. In selecting these, I was not so much concerned with old-world but with timelessness, in finding a way to express a sense of something greater than oneself. For this the body needed to be less important than the expression and emotion. In “Of Smoke and Gold” I worked with many new character costumes, like a Native American Indian, French Soldier and African Tribesmen, mostly from the past, but in an effort to express a connection between all of mankind, every race, gender and social class. There’s even a life-size skeleton and a clown, who represents that crazy, wild and fun side of man. Originally, I had more characters, but many of the costumes got destroyed underwater and/or were cut out of the final selections. What kind of equipment do you use when making these pictures? Right now I’m shooting with a Canon 5D Mark III. All other equipment can vary from pool to pool, but I like to keep it as simple and natural as possible. Your models all seem very comfortable working underwater. Did you seek them out because of a certain skill set, or is that something that you learned and developed together? Up until this point I’ve been selecting artists, musicians, dancers and individuals for their willingness to improvise and experiment and for the way they inspire me, but now that I am shooting video, ease and breath-holding abilities are becoming much more important. I’m fascinated with working with everyday people that I meet because they’re real about their experience in the water. It’s demanding to be down there but that’s also what I want to capture, that struggle and vulnerability. The beauty is to work together to overcome these obstacles that are placed in front of us. So we practice a lot together and I shoot excessively so we have a flow and momentum picks up. These photos were all shot in local pools in Hawaii. Have you ever worked in organic water sources (ocean, lakes, etc.)? Why or why not? I have experimented in other water sources like the ocean, but because I work at night and in such a particular fashion, the pools allow for better control and clearer water. These days I’ve also been shooting for longer periods, so the water needs to be heated. Your photos have an almost painterly quality, and you’ve often been compared to Baroque masters such as Caravaggio and El Greco, with the rich colors of Titian and the experimental element of Bill Viola. Who would you say are your biggest influences? I love musicians, poets, filmmakers and painters like Georges Méliès, Wolfgang Amadeus Mozart, U2, Banksy, Federico Fellini, Peter Paul Rubens, Gottfried Helnwein, Itzhak Perlman, Baz Luhrmann, Jean-Luc Godard, Steve Jobs and more. They remind me that the world is full of beauty, hope and freedoms. But I’m mostly influenced by something within that can’t be explained in words. It’s something that needs to be expressed about the synchronized beauty and chaotic nature of mankind. Where does the collection name “Of Smoke and Gold” come from? I had this realization one day about how connected we all were to each other. We could either drag each other down or pull each other up. And it gave birth to the title “Of Smoke and Gold.” And it was as if we were all made of both but had this choice to select one over the other. Starting Nov. 2, “Of Smoke and Gold” will be on display at Galeria de Arte AFK in Lisbon, Portugal. 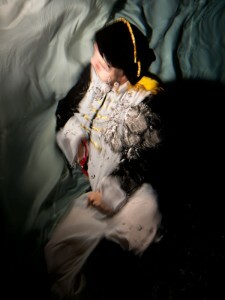 Rogers will also have a solo show at the Fotofever Art Fair in Paris, Nov. 15-17. 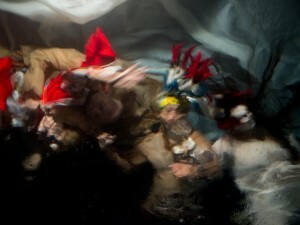 In addition to her underwater photography, Rogers also works in video. Check out some of her work, as well as a behind-the-scenes look at one of her Hawaii shoots, here! 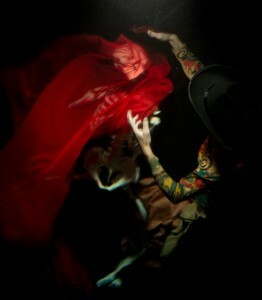 Christy Lee Rogers’ OF SMOKE AND GOLD from Christy Lee Rogers on Vimeo. 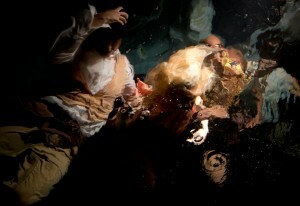 The Making of Christy Lee Rogers’ OF SMOKE AND GOLD | Behind the Scenes in Hawaii from Christy Lee Rogers on Vimeo.